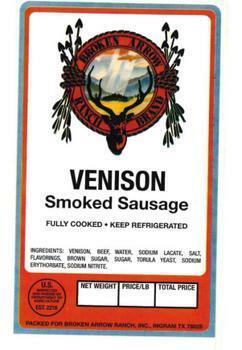 Yoakum Packing of Yoakum, Texas, is recalling approximately 12,388 pounds of smoked venison sausage. The product contains pork, which is not listed on the label. 2.5-lb. plastic wrapped bags containing frozen sausage links of “VENISON Smoked Sausage – FULLY COOKED – KEEP REFRIGERATED” and case code 35710 or 35712 represented on the label. The recalled product, bearing establishment number “EST. 2216” inside the USDA mark of inspection, was shipped to distributors and retailers in Texas. Customers who purchased the recalled product should not consume them, but discard or return them to the place of purchase. Consumers with questions about the recall may contact Glen Kusak, at (361) 293-3541.